Note that the formatting and font has been maintained as the original source scan. Originally called the “TED’, Commodores’ new 264 and 364 are their latest entries. Commodore has finally given us computer. The long awaited event looks place at the Winter Consumer Electronics Show in early January. The C264 is not an enhance CM, but a completely new machine geared Inc the home market. The new 8-Bit machine, announced amidst much hoopla and fanfare will feature “built-in” software on ROM. CHAR -CHAR X, Y, “STRING” will print “STRING’ at an X,Y position on the hi-res screen. very handy. Several new peripherals will accompany the 264 including a letter quality and dot matrix printer, A new colour monitor, the 1703 is merely the 1702 in a new black case, but a new faster disk drive, the SFS 481 another 264 peripheral. The 1531 Datasette is the same unit with a new plug, useable only on the 264. The 264 Modem is supposed to be auto answer/auto dial. Rounding out the hardware end of the computer is a new plotter. Software compatibility will be a sore spot with new owners of the 264. VIC and 64 cartridges won’t work. Most existing programs won’t work either unless they are pure BASIC. The problem lies in the systems electronic architecture. If you know the difference between an operating system and an operating table, you may be wondering how an 8-bit microprocessor can address 64K of RAM. 32K of O/S ROM and an additional 32K of program ROM. The feat is accomplished with a sleight of hand called “bank selected memory”. The 7501 Microprocessor can only “see” 64K of anything at once, but with careful memory management, it can switch in (or out) different blocks of memory so the total of 64K is never exceeded. The bank selection process is done automatically so you don’t have to worry about it. Long-winded programmers will now be able to write programs (in BASIC M.I. or both) of up to 64K in length. The 264 is the first of four New Generation computers due for release this year. The next one, the 364, was shown at CES but it looks like it will be summertime before it makes a market appearance. 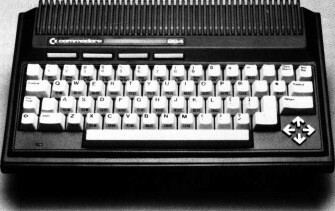 The 364 is architecturally the same as the 264 but has an extra 19 key numeric pad, a few more empty sockets inside for software ROMs and built-in speech with 250 word vocabulary. Prices and release date are not yet firm, but the 264 should be in the $400-$600 US range. The new C264 and 364 are an interesting progression in the Commodore evolution. No sprites, no 3 voice sound, yet very powerful. Perhaps they’re leaving that combo for the next step. Whatever the case, the 264 will fill another gap. The added memory, commands and display features will give a new look so Commodore business software, especially the luminance control. It’s compact, inexpensive, and ROM software will make it convenient. The Commodore 64 will remain the superior games machine but the SSHAPE, CSHAPE and the other VSP commands will produce some handsome graphic control. It almost seems like Commodore has omitted the advanced graphic and sound capabilities to avoid instilled anxiety to potential business software writers. I suppose only time will tell how well they’ll get along together as a family.